Buffet!! Can You Eat It All? Buffets are everywhere! Be it in restaurants, functions, meetings etc., buffets have become the preferred style of menu. With so many choices and variety right in front of your eyes, it becomes difficult to refrain from eating unhealthy food. • Sit away from the buffet table: Find a table away from all the food. This has been found to work efficiently since people tend to take fewer trips to the buffet table than the people sitting nearer. • Do not sit facing the food: As the famous saying goes - out of sight, out of mind! When you sit with your back to the food, you will be less tempted to eat all the delicious looking food. • Take a look around: Before you start your meal, take a look at all the dishes they are offering. This will help you plan your meal better. • Have small servings: Just because there's a lot of food, you need not fill your plate with just one dish. Take small servings (1-2 tablespoons) of all the dishes you want to try. If you like a particular dish, you can go for a second serving. • Always start with a salad or soup: Every buffet will have at least 2-3 different types of salads or soups. Always start your meal with either of the two or both. This will make you eat less. 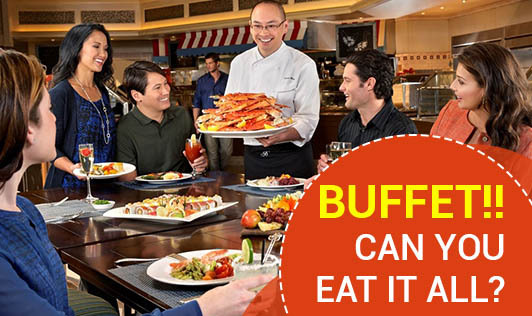 • Never go on an empty stomach: Most people make the mistake of starving before going to a buffet. This will inevitably result in over eating. So avoid going on an empty stomach. • Taste first: Some foods may look tasty but may not be as tasty as it looks. Others may not look so good but may taste really good. So, get a taste of everything before you fill your plate with anything. By doing this, you will prevent wastage! • Take fewer trips to the buffet table: By taking fewer trips, you will be compelled to fill your plate with more variety and less quantity. • Take smaller plates: It has been found that bigger plates make you eat more. So, take smaller plates to enjoy your meal. Though it may not be easy to follow all these steps while you're at a buffet, try incorporating a few steps to make healthy choices! It's your health at the end of the day!